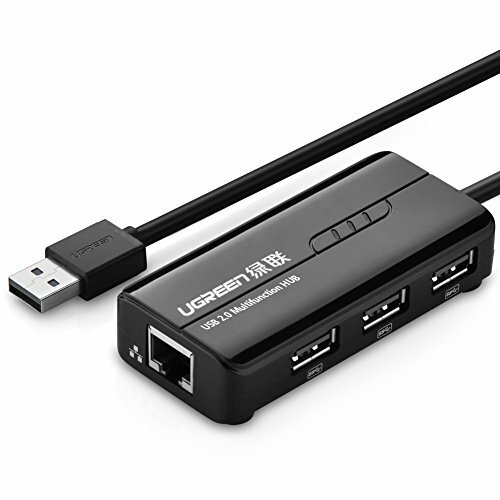 Ugreen 20264 USB 2.0 Hub 3 Ports with 10/100Mbps Ethernet Network could not only add a network interface to your computer via USB,but also to connect your computer to multiple devices, such as digital cameras, PC fans, flash driver. It is an ideal solution for notebook, tablets that do not come with ethernet port. It is a perfect solution for Nintendo Switch, Wii, Windows Surface Pro, MacBook Air,Retina and more which donot have ethernet interface, or replace a broken ethernet interface on PC. 4. Additional DC-jack is optional for some power-hungry devices. This hub is designed to work as a data transfer hub, not as a stand-alone charger. It cannot provide power to multiple devices with a combined current over 5V/500 mA. DUAL FUNCTIONS: USB 2.0 hub Ethernet adds 3 x USB 2.0 ports and 1 x RJ45 10/100 Ethernet port to your computers and notebooks. FASTER&MORE RELIABLE: Full 10/100 Mbps fast Ethernet performance over USB 2.0's 480 Mbps bus, with usb powered, link and activity LEDs, the hub network adapter is faster and more reliable than most wireless connections. GREAT COMPATIBILITY: This USB ethernet adapter with 2.0 hub supports Windows 10(32/64 bit) 8.1 / 8 / 7 / Vista / XP, Mac OS X 10.6 to 10.9, Linux 2.6.14 or above. For Windows 8.1 and some Mac users, we recommend downloading latest driver from ASIX website or contact our support for it. SLIM&PORTABLE: With slim portable size, the lan adapter hub is a good solution for adding a standard RJ45 port to your Nintendo Switch, Wii, Ultrabook, notebook, or Macbook Air, iMac Pro, for file transferring, video conferencing, gaming, and HD video streaming. 3.5mm x 1.35mm DC jack to connect the additional power plug for power-hungry devices, like HDD. Please kindly note: this product ONLY works with DC 5V (Center Positive Polarity) adapter for power supply. USEFUL FEATURES: Use the usb rj45 hub to replace your broken internal network port on desktop and laptop, add a separately-routable network interface, and transferring files at superfast speed over an Ethernet port.